Governor Nyesom Wike of Rivers State has called on Nigerians to establish the platform for the swift revival of the country by voting for Atiku Abubakar on February 16, 2019. This is as thousands of Gokana people defied a heavy downpour to prove their support for Governor Wike. For close to two hours, Gokana people celebrated the key projects of the Rivers State Governor in the area, assuring him of their votes during the forthcoming elections. 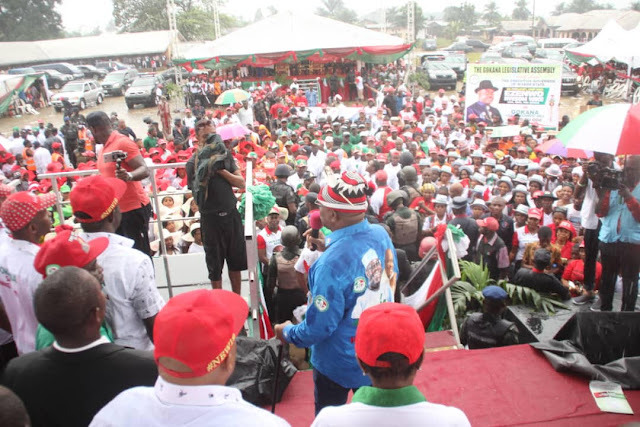 In his address, Secretary to the Rivers State Government, Sir Kenneth Kobani said the rain is a sign of victory for PDP.